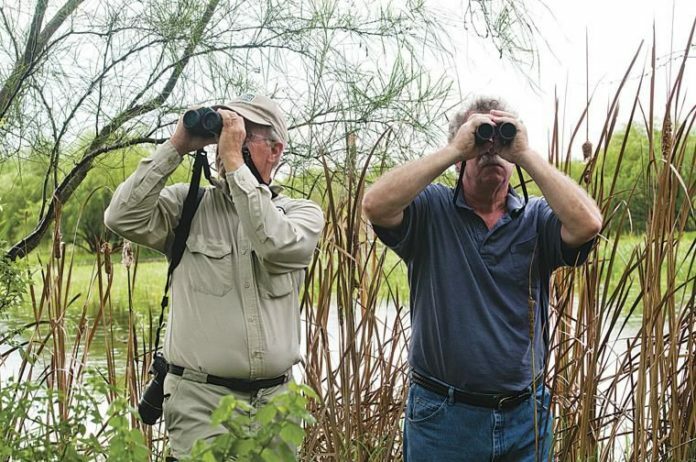 Birders search for birds with their binoculars during the 2013 Rio Grande Valley Birding Festival. HARLINGEN — One of the Valley’s high-flyers is about to turn 25 this year. Organizers of the 25th Annual Rio Grande Valley Birding Festival believe they will top the previous year’s festival with even more attractions for world birders. “We are just completing all of our field trip plans and getting the pricing on those and getting those into our web page,” she said recently. The festival runs from Nov. 7 to 11. The field trip postings on the birding festival’s website at www.rgvbf.org are eagerly anticipated by people intending to travel to Harlingen for the event. Since the trips are first-come, first-served when it comes to registration, some of the more exotic or interesting trips fill up quickly. This year a pre-trip is scheduled for Laredo, and a guided post-festival trip will be available to El Cielo, Mexico, to the biosphere preserve just south of Ciudad Victoria. She said the 25th festival also will continue making itself amenable to people with mobility issues. “We’re going to continue that this year,” she said. “We welcome anyone with a wheelchair, a mobile device or even just a walker. Griffin has been affiliated with the festival practically from its beginning, for 21 or 22 years, she said. This will be her fifth year as chair of the festival which is based in Harlingen but extends across the Rio Grande Valley and South Texas. “It has just been a phenomenal success,” she said. Last year, 600 participants signed up for the guided birding tours, and she estimates another 2,500 to 3,000 people visited the Municipal Auditorium Complex to visit with vendors and purchase birding gear like field glasses and spotting scopes. “We hire between 80 and 90 guides, and then you’ve got another 100 volunteers who are there for either the entire year as a volunteer, or a number of our volunteers just come and work one shift one day or they work for a couple of hours every day,” Griffin said.